This week was focused on young people being engaged citizens and how one is able to be an activist. Social media allows for anyone to be an activist as you can create and share videos, pictures, music, etc. that have to do with what you are passionate about. We have been given the opportunity to create an activist video on homelessness. I was nervous at first as I have never created a documentary on such a hard-hitting part of our society. My group was able to interview a fellow Saint Joe’s student who works directly with homeless people every weekend. It was a very eye-opening interview. She was able to talk so passionately about the issue at hand, and what it’s like to talk and be with these individuals who are struggling. She told us all about the program she works with and the great things that they are doing to make a change in the community. This is where online activism will come into play. This person is not just sitting at home and sharing articles or events on Facebook about how to make a difference. She is actually going out into the world and making a change in these people’s lives. Online activism is great for spreading the word, but it needs to go one step further than just sharing and liking. Young people are becoming more and more involved in politics and the world’s issues, and social media is giving platforms for all these individuals that can use it as a stepping stone for making a change in the world. It’s becoming easier and easier to organize protests and movements, and young people are taking responsibility by making their voices heard. Civic Media focused on homelessness this week and what it means to be homeless. Something that I now know is that homelessness is a state of mind, and you’re really on homeless if you believe yourself to be. Many different people live on the streets for different reasons. They all have various kinds of backgrounds, and education levels, and family situations. They have all ended up on the streets, whether it be temporarily or for the rest of their lives. The important thing is that we are activists for them. Although homelessness will not be able to be completely stopped in our lifetime, we will still advocate for change. Video advocacy is one medium that we are able to promote social change with. In the next few classes, we will be given the opportunity to hone our creativity and create a video that calls people to action on the issue of homelessness. I hope to create a video that informs a viewer, and also makes them want to learn more. I want them to stop watching the video and think about what they should do next to join this movement. This week in Civic Media, we discussed the many different situations where social media was able to be used in activism. Social media has been able to trigger protests, and then continue to be used throughout the activist’s demonstrations. Even though social media was never intended to be used for political purposes, it has become a pivotal part in protests all around the world. Technology has allowed civic media to be beneficial and worthwhile in our society. To step back, what is civic media? Civic media is using a platform to empower and engage a community, either on a small or large scale. It is able to point out problems and issues in our society and get people to rally behind those issues. It can connect many different people and opinions, and overall can make individuals more well-informed. When Michael Brown was tragically murdered by a police officer for not doing anything wrong, Twitter was a platform where you could easily follow what was going on in those protests. For me, I was not as aware of police brutality before this kind of civic engagement. It felt like I was experiencing first-hand what was occurring in Ferguson, Missouri because of how up-to-date my social media was. I could see pictures, videos, interviews, all happening right then and there. Similar to what happened in Arab Springs, because of social media, a whole global community was able to rally behind the censorship that was happening. Nawaat was also censored which angered people and thus made people learn and adapt other ways to get to see their messages. Media was meant for interactions, but it can’t just be that. We have to engage with others and by trying to make changes in society, media becomes a more engaging way of life. The Ted Talk I decided to watch was by Arthur Benjamin. He discussed the magic of Fibonacci numbers. I was to focus on a Ted Talk that focus on patterns, and so when I googled “Ted Talk about patterns” I was excited to see how Arthur Benjamin would talk about patterns in relation to the Fibonacci numbers. In class, we have mainly focused on patterns that aren’t numbers or letters. This was a different pattern that I wasn’t used to when it comes to Visual Rhetorics. He began by saying that in school, students always ask when they will need to use math in the real world and how they never get a straightforward answer. He then goes on to discuss what kind of “number patterns” the Fibonacci numbers display, and how there are many kinds of patterns hidden that you can discover using mathematics. Benjamin finds math to be a lot more fun than I do and says that “as much fun as it is to discover these patterns it’s even more satisfying to discover why they are true.” He closes by showing some examples of how the Fibonacci numbers can be used, and saying that schools should focus more on application instead of calculation. I particularly enjoyed myself doing this project. We had to create our own pattern stamp by carving something out of a potato. After, we would put paint on the pattern and repeatedly stamp it onto paper until it was filled up. Then, we then had to collaborate with a partner and each use our stamps on a different sheet of paper to make a completely different pattern. After trying twice on two potatoes, and cutting my hand three times as well, I decided that I wanted to use a circular pattern. I definitely did not expect carving to be as tricky as it turned out to be. I then got black paint and a paintbrush and started experimenting and practicing with my new stamp, which according to some of my classmates looks like an ear, an avocado, and a doughnut. After I was done practicing, I got paper and started my pattern. I think the stamp created and cool pattern after being used so many times. I also like how there are different shades of black. It makes it look less uniformed and more unique. Next up was the collaboration pattern that I did with Brendan’s stamp. Both our stamps started off going in a straights line and then bounced off of each other. The rest of the path they take is bouncing off the paper and eventually going off the page. I modeled this piece after the Notan Project we did in the beginning of the semester. This is where we played with empty space using dark and light paper. I did the same thing using a leaf. I ripped shapes out of the edges and put them on the outside. It’s hard to tell what I was trying to accomplish here. It didn’t turn out the way I had hoped. The wind started picking up around this point and I had to keep putting the pieces back. This was around the time where I realized how hard making art in the outdoors is with the elements. As I said in one of my other Andy Goldsworthy posts, I think that its interesting when nature is organized in a way that is not natural. It’s an interesting concept for me because of the way it looks and that I’m not used to it being such a way. square with sticks and then organizing as much as I could into that small area. I used sticks, pine needles, pinecones, and chestnuts. I first put different sized sticks in. 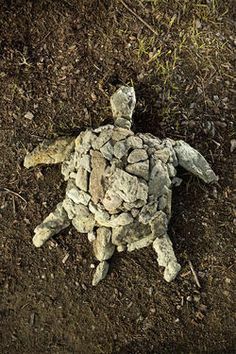 After looking at many of Goldsworthy’s work, I concluded that he hasn’t created any sort of text (he has created a cute turtle). However, he does like to use sticks in creative ways. Therefore, I decided to use sticks to create a grid. My idea was to use pine needles to spell out my initials within the confines of the grid. Although this is not something that nature would make, it’s not as creative and refined as the kind of things Goldsworthy makes. His work is very mystical and intriguing. He leaves me in awe with his art. I was able to complete my idea, and I think it turned out well. Goldsworthy doesn’t focus too much on texture in his work. I like to view his work as almost organizing nature and turning it into something beautiful that nature itself isn’t capable of. I wanted to use opposing textures for this work and used chestnuts. One texture is spikey, the other is smooth. I organized the two opposing textures into opposite sides. I wanted to keep in mind a quote from Two Autumns: “the most simple things can be the most profound.” My idea was simple in separating the textures, but I think it shows how contrary they are and how they have come from the same place but are still incredibly different. This idea is similar to how Goldsworthy can make “connections and relationships between places in different parts of the world” because of his art. Andy Goldsworthy focuses on color when he makes his creations using leaves. He sees one color in a leaf and “out of a sense of curiosity (he) starts collecting the colors to see how many colors there are. And to see the range of colors” (Two Autumns). He is able to make a work of art sometimes using one color of leaves, or multiple colors. My favorite creation of his that was shown in the documentary Two Autumns was when he found a rock in the midst of a river, and covered it in red leaves. It looked like the rock was entirely red and was meant to be red in the first place. After finishing, he felt like he knew the rock on a deeper level. My creations using leaves weren’t as elaborate as Goldsworthy’s. I tried using color with leaves in two different ways. My first creation was modeled after one of Goldsworthy’s where he pinned a line of leaves together and sent it down the river. The line began with one color and then gradually changed to another color several times throughout the line. I wanted to so something similar and so I collected leaves and set them up going from dark to light. I made another project and focused on the color yellow and set all the different shades of yellow leaves that I found in a circle to resemble the sun. We learned about grids in class for this week. Our assignment was to create our own typography and then download it onto our computer. We had to try and create our new typeface to look like our handwriting. We needed to make decisions on many different characteristics of the font including the parameters, dimension, proportion, shape, and optical correctness. After a lot of playing around with the modulator, I had created many different kinds of fonts but none that really matched my handwriting. I did like some of the typography I made, and I ended up finishing with this one that resembles my handwriting slightly. I wasn’t able to create an exact match, but I like the end product and think that it is easy to read. This week, we had to design a classroom within the dimensions of a 40 by 8 feet shipping container. Since these dimensions offer a very long container instead of wide, we had to really think about what we find important in our desired classroom while also offering a productive work space. I wanted my classroom to be able to fit as many students as possible, and to also have a space to relax. Additionally, I wanted to have technology and a lot of windows. I like the layout of a classic classroom, where every student has their own space as well as the teacher. Since fitting a lot of students into these dimensions was important to me, I wanted to figure out the layout of the desks first. After some trial and error, I decided upon this layout that fits 10 students. Next, I had to find comfy seating that could fit in the rest of room. After that I added windows, televisions, carpets, chairs, a white board, hooks, shelves, and paintings. I was happy with the end result because it was what I had envisioned in my head. I think my design offers a comfortable setting for learning that is conducive to the small size of the area. I struggled with this assignment. We had to make a Buzzfeed article using the Buzzfeed interface and then post it to the website. What I struggled with was coming up with an idea. I ended up making two posts. One is a personality quiz, and the second one was a list of 6 things. My first post was called “Which Type of Glenn Are You?” I made this quiz because there’s nothing like this kind of quiz on Buzzfeed, and I got to include one of my favorite shows. This post took a long time as I had to find 6 or 7 different pictures for each question. I was happy to be finished once I had everything together, but I wanted to make another one because I wasn’t entirely satisfied with the piece. After writing this article, I realized that I liked my first post better. It seemed more intriguing to me because it was an interactive quiz. I also realized that I didn’t check that my first quiz would be suggested for the Community editors. I did check for the second post, but I couldn’t go back and edit it for my first one. Here’s my first post and my second post. I wanted my article to fit in well on the Buzzfeed website, and so after I finished both my articles they seemed kind of childish. There was almost an overload of pictures that didn’t go well together as a whole. I didn’t like the clutter of it all. There was too many pictures, but I tried to make each one relate to an answer of the question. It was semi-humorous with the pictures, so I wasn’t trying to write very serious articles. Unfortunately, I don’t think that there is much value to either of my articles. The first one is more for entertainment sake and is specifically aimed towards The Walking Dead fans. The second article shares an experience that some people may also relate to. I’m not sure if that would make it have an value. I did enjoy creating these articles as it created a new experience and exposure to a different kind of blog type. Next, I had to decide how I was going to organize my poster. I did how far each trip took traveling from New Jersey. I organized it from the shortest to longest plane rides. Placement was difficult and finding an image size that fit everything that I wanted to have on my poster. It helped being able to sketch it out first on paper, and then putting my idea onto Photoshop. Next up was finding the pictures that would be used, and what colors and typography would look best in the layout. I went with black, white, and green for the text so that it would stand out. I used the paint bucket to make all of the places black. I would make the outside of the poster maybe a light shade of gray so that it’s easier to see where the poster starts and ends. I would also make the text a darker color so it stands out more. Overall, I am happy with the result of my work. It was stressful when positioning everything, but after figuring it all out I was happy with the layout. For this project, we learned about alignment in photos that can balance an image. We first took our own photos, and then I layered the Golden Ratio and Rule of Thirds Grids over some of my favorite photos. I then adjusted the transparency so that you were able to see the image and the grid. With the grid on top of the photo, you are able to see where your eye is drawn. The Golden Ratio was first up. After rotating the spiral so that the intersecting lines matched up with the subject, I placed the grid onto the image. I like how the Rule of Thirds images came out. I used the grid on two different images, and the subjects are confined within one of the thirds. It was interesting to have a grid pinpoint where your eye is drawn to in an image. I liked having the different kinds of grids to show where the best places to have a subject are located within a frame. In Visual Rhetorics this week we focused on color. We first had to find our signature colors hex code. I made a color palette for myself based on my signature color which is Dazzled Blue or #304C7C. This was the picture I had taken for me (shoutout to Brendan) that I used for the activity. I made sure that automatic focus was on so that I would definitely be in focus. It still turned out blurry when I had to zoom in on my eyes which may have to do with the amount of artificial light and not natural light. My first attempt started by sampling colors in the eye and exaggerating them. The colors then had to be blurred. As you can see in the next image that there is hardly a difference. I brightened the eyes and there was a slight change. I was quite disappointed that I did not get the results that I had hoped for. Hopefully, after a bit of practice my eyes will get brighter. After my frustration with this method, I tried a completely different tactic that admittedly resulted in some bold results. I took the same picture and used the magic wand tool to outline my eyes. I then used the paint bucket tool to make my eyes blue. It turned out more creepy than I had expected, but I think the result is amusing. Texture is everywhere. Every surface and object varies in texture. When taking photographs, I wanted to find texture that looked interesting. Not really a texture that you think looks interesting when passing by, but close up you notice the uniqueness of it. My first image incorporates several different textures. It uses the wood from the desk, the criss crossing of the fabric that is the lamp shade, and the designs on the sketchbook. My next image is of the blinds in my room. I thought it would be interesting to see each side contrast and be asymmetrical instead of symmetrical. My next image is of my rug (one of the comfiest rugs ever). I thought the texture of this was refreshing because of how unique it is to all the other textures in the room. The next image was of two completely different floor textures. On the left is wood, and on the right is tile. I thought this would be a cool image because of the obvious distinction and line between the two textures. My last image is of the table mats on the kitchen table. The reason I took this picture was because of the directions the lines are going. The table mat has a circular texture. While the table has lines going straight. I thought that the differences and how contrasting they are were engaging. I found this design activity very fun. I love taking photographs and so I enjoyed having the opportunity to train my visual eye to observe more textures, and how those textures relate to the environment they’re in. This proved to be a difficult project for me. I found the concept interesting, but quite hard to execute. The project was to spell out a word using our surroundings. It is called alphabet photography. I wanted to use my name. The first “A” are vines coming over a wall. The first “N” is the bottom half of a sign. This letter is my least favorite one as it is hard to depict what the letter is. The second “N” is the archway leading to the train tracks. The last “A” is the legs of a picnic table. Although I found this project frustrating, I think it has helped train my visual eye to see my surroundings as something other than what they are. For this project, we experimented with light and dark harmony. Our design could be anything we wanted, we just had to follow the Notan procedure. I loved this project. I thought the concept was interesting, and the end result compelling. The first step was to, of course, gather all the needed materials. Next, was to draw on the black paper. We could draw anything we wanted, but the sketch had to start and end on the same side of the paper. For example, I drew triangles and the shape starts and ends on the top of the paper. The next tedious task was to cut out all of the shapes. We had to keep in mind that we had to keep every piece of paper, so it was nerve-wrecking since I didn’t want to accidentally lose a tiny part of a shape. This was probably the most difficult step in the process. After, we placed the main part of the black paper in the center of the white piece of paper. The pieces that you cut out will be flipped alongside where they were originally. It was difficult to visualize what the finished project would look like. I had an idea of what I wanted it to look like, but it turned out differently. Once I started sketching I just decided to wing it and hope for the best. I then had an idea after I finished two of the sides. I decided to make the two sides that are opposite each other be similar in design. So two sides don’t have hard lines while the other two do. The staircase and triangles have hard edges. The spiral and waves have soft lines that aren’t straight and are unique. Learning to use the pen tool in Photoshop was admittedly a struggle at first. The initial struggle came with getting used to using the pen. It was difficult and frustrating at first, but after practicing it became easier. I had a hard time going from a curved line to a straight line. Once I discovered that using the ALT key allowed you to go from a curved to straight line, there was less frustration. Fortunately, I was surrounded by classmates who were able to help. The Bezier Method website proved as a useful tool in cultivating this skill. The PHLEARN video was also a very helpful resource that went step-by-step through the process. It was easy to follow along and provided lots of helping information. The creative part began when we were tasked to use a picture of ourselves and put our face onto a different background. I was happy with the idea and became determined to get myself into that picture no matter how long it took. The first step to achieving this was to, of course, put both pictures onto different tabs on Photoshop. Next up was of course cutting myself out of the picture. I used the pen tool and began going around myself. I zoomed in so it was easier to tell where the subject curved and where it went straight. After a somewhat easy few minutes I had connected the two anchor points. I made the selection on myself under paths so that I could easily move around the section that I had outlined. I then copied the selection and went to the other tab where the picture of Beyoncé and Jay-Z was waiting for my arrival. I pasted the selection of myself onto the picture and used the free-transform tool to make me look more proportionate to my dinner dates. I was happy and proud with the result, and accomplished what I wanted with only my first use of the pen tool in Photoshop. I hope to improve my skills and make it look more realistic.